Do CoolXChange Compression Bands Really Work for Instant Pain Relief? DO COOLXCHANGE COMPRESSION BANDS REALLY WORK? YES! The CoolXChange Compression Bands Really Work! Now that we have transitioned into spring, you start to see more people active on the streets. Let me tell you, with more activity, we often see more injuries. If you are like most, you probably already increased your daily activities or exercise routines. As a result, your new activities require a lot more standing, walking or running. Consequently, widening the window to injuries such as sprains, heel pain, plantar fasciitis, and muscle pains, etc. 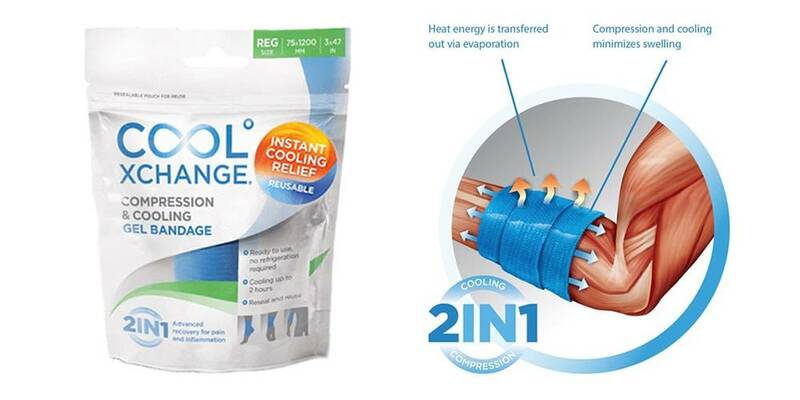 If you’ve had the unfortunate luck of injuring yourself, you probably asked, “Do CoolXChange compression bands really work?” or “Can a coolexcahge compression and cooling bandage help me manage my pain and inflammation?” YES! The CoolXChange Compression Bands Really Work! For one thing, to really understand if compression bands really work you must first understand how your blood flows through your body. Consistent compression on the walls of your arteries will cause them to expand, increasing your blood flow. Resulting in an increased oxygen and nutrients flow through your body. At the same time, your veins’ walls shrink under compression, accelerating your blood flow. In turn, your blood flow speeds up to your heart quicker which helps you increase your rate of recovery; ultimately, decreasing most muscle soreness. CAN the CoolXChange Compression Bands Really work for ME? Absolutely! CoolXChange Cooling gel bandage is both a compression and cooling gel bandage that helps you manage pain and inflammation. It provides cooling and compression therapy in one simple step, helping you recover from muscle sprains and strains faster and more effectively. WILL THIS BAND PROVIDE ME WITH INSTANT RELIEF? 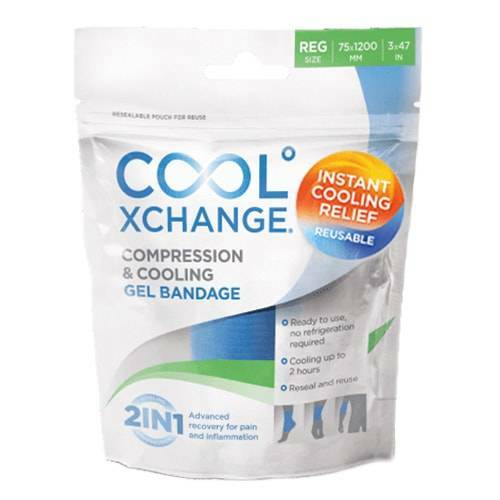 CoolXChange Gel Bandage works instantly and can be worn continuously for extended periods of time, without causing ice burns, unlike traditional cooling methods. It is ready to use right out the package, making it easy for you get instant relief when you need it most. The CoolXChange is an innovative gel bandage that advances R.I.C.E. (Rest, Ice, Compression and Elevate) method which is widely regarded as the best way to aid in recovery from sprains and strains. By combining cooling and compression, the elastic compression reduces the amount of blood flow and heat in the injured area, which minimizes pain and swelling. In addition, clinical studies show the CoolXChange gel bandage works immediately and continues to provide cool therapy for up to 2 hours, dropping skin temperature by over 10 °C. CAN I USE THE COOLXCHANGE WITH MOST SUPPORTS AND BRACES? You can easily combine your CoolXChange bandage with most supports and braces. It is thin enough to wear with most supports and braces and thick enough to get the job done. 2-IN-1 compression and cooling gel bandage. Wear it for extended periods without the risk of ice burns. Multiple uses: ankles, feet, wrists, elbows and fingers. Ready to use anywhere, anytime. Immediate and continuous cooling for up to 2 hours. Decreases skin temperature by over 10°C /18°F. Does not contain menthol or medications. Easy to carry, in first aid kit or sports bag. WHERE TO BUY COOLXCHANGE COMPRESSION AND COOLING GEL BANDAGE? To purchase a CoolXChange Compression and Cooling band, come into any one of our stores, located in Anaheim Hills, Costa Mesa, Rancho Cucamonga, Riverside, San Dimas, Temecula, La Quinta or Palm Desert! At Lucky Feet Shoes, we carry many foot care accessories and comfortable shoes. If you are looking for foot care accessories and comfortable shoes in Orange County, the Inland Empire, Los Angeles County, Temecula or Riverside; we have eight stores to serve you! Come and visit us today! If you are looking for shoes for foot care accessories and comfortable shoes in Anaheim, Anaheim Hills, Yorba Linda, Brea, Orange, Placentia, Costa Mesa, Santa Ana, Fullerton, Irvine, Villa Park or Tustin; then visit our store in Anaheim Hills or Costa Mesa. If you are looking for shoes for foot care accessories and comfortable shoes in San Dimas, Glendora, Pomona, Covina, West Covina, La Verne, Azusa, Diamond Bar or Claremont; then visit our store in San Dimas. If you are looking for shoes for foot care accessories and comfortable shoes in Rancho Cucamonga, Ontario, Upland, Fontana, Rialto, Chino, Chino Hills, Mira Loma, Eastvale, Colton or San Bernardino; then visit our store in Rancho Cucamonga. If you are looking for shoes for foot care accessories and comfortable shoes in Riverside, Moreno Valley, Corona, Rubidoux, Loma Linda, Grand Terrace, Redlands or Norco; then visit our store in Riverside. If you are looking for shoes for foot care accessories and comfortable shoes in the Temecula Valley, Murrieta, Fallbrook, Lake Elsinore, Wildomar, Hemet, San Jacinto, Pala, Sun City, Menifee, Canyon Lake, Perris, Bonsall or Anza; then visit our store in Temecula. If you are looking for shoes for foot care accessories and comfortable shoes in Indio, Coachella, Thermal, Vista Santa Rosa, Valerie; then visit our store in La Quinta. If you are looking for shoes for foot care accessories and comfortable shoes in Cathedral City, Thousand Palms, Palm Desert, Palm Springs, Desert Springs, Rancho Mirage or Bermuda Dunes; then visit our store in Palm Desert.